How do you install window awnings on a 36-foot Bounder? 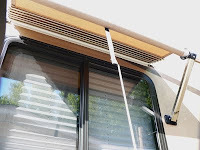 Donna, the correct method of mounting window awnings on any RV is dependent upon the manufacturer’s recommendations and the type of construction of the coach. In other words, it depends on the brand of window awning and whether enough mounting support is available inside the sidewalls. All manufacturers provide detailed installation instructions with their awnings for all types of sidewall construction methods. Your Bounder has vacuum bonded, sandwiched sidewalls which may or may not require additional support for the window awnings. There is usually plenty of “meat” directly above the windows where the awning rail is secured, but it’s also important to have a firm foundation where the arm brackets mount. Fleetwood has typically add sufficient supporting materials inside the walls during construction for future awning installations. Additionally, each awning requires a certain amount of pre-tension on the spring assemblies. This is determined by the length of each awning. Again, the manufacturer will have all these specs in the installation instructions. If you happen to have some awnings without any installation instructions, contact that awning manufacturer directly. They will gladly provide you with a set of installation instructions and/or perhaps guide you to an on-line source of instruction; many makers have downloadable instructions on their websites.